If your future construction plans involve remodeling or adding a room, building a new custom home, multi-family structures, or a commercial new build or tenant improvement, you are well aware that there is an enormous amount of planning that will go into these projects, ranging from architectural designs, hiring a professional General Contractor along with top-notch sub-contractors, to obtaining the proper permits to ensure that your project is done right. At PJO Insurance Brokerage, we feel that one of the first steps you should take is to acquire a Las Vegas/Clark County, NV Builder’s Risk Policy, also sometimes referred to as Cost of Construction Insurance Coverage. Las Vegas/Clark County, NV Builder’s Risk Policy/Cost of Construction Insurance is a specific type of property insurance coverage which guards against damage to structures while they are under construction. By purchasing a Las Vegas/Clark County, NV Builder’s Risk Insurance Policy, you are providing protection for a company’s or an individual’s insurable interest in the equipment and/or fixtures, structure, the materials that may be used in the course of remodeling an existing structure or commercial building or a new custom home construction or commercial building in the event that they suffer damage or a physical loss from one of the covered causes of loss contained in the Las Vegas/Clark County Builder’s Risk Policy. Please take note that whether your construction plans involve renovating your current home or building a new custom home, very likely, your current Nevada property insurance policy will not cover any losses should an accident occur while you are remodeling your home or building a new one. At PJO Insurance Brokerage in Nevada, we feel that it is highly important that this type of insurance coverage be purchased well before the construction project begins. The very last thing you want to discover after you suffer fire damage, theft, or some other development that will cost your company substantial amounts of money is that there was no coverage acquired to cover the project, and now the repair or replacement costs will come out of your pocket. We advise our clients to follow one rule: before you start either a commercial or residential construction project, make absolutely sure that either the property owner or the general contractor purchases a Las Vegas/Clark County, NV Builder’s Risk Insurance Policy, so the project will be covered, and there won’t be any surprises if something should happen. In purchasing Las Vegas/Clark County, NV Builder’s Risk Insurance Coverage, the policy will contain a maximum payout of the coverage limit which is stated in the policy. It’s very important that when planning your project to keep in mind the following items in determining what the value of the builder’s risk policy needs to be: overhead, labor and material costs, but not the cost of the land. Also, when determining your final figure, ask yourself , what would it cost to start this project over again from the beginning. A Builder’s Risk Insurance policy can be written for a three month, six month, or twelve month cycle. If the project is going to take longer than 12 months, you can purchase a longer term policy, which, generally, can be extended once if it needs to be. 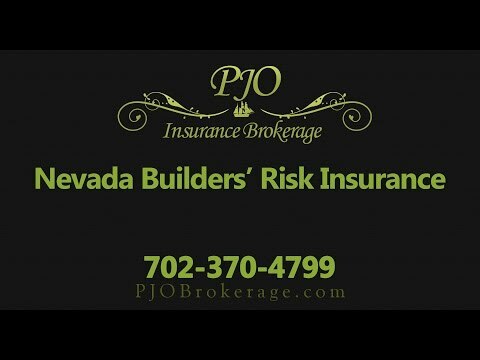 PJO Insurance Brokerage works with numerous Builder’s Risk insurance carriers and has the expertise to guide you through the process, making sure you understand what is covered and what is excluded on your Las Vegas/Clark County, NV Builder’s Risk Insurance Policy. If additional specialized coverages are required for your project, we are also able to handle those additional coverages. We would welcome the opportunity to work with you or your company on your next new home, commercial building, or renovation project. To request a quote, please call the professionals at PJO Insurance Brokerage.